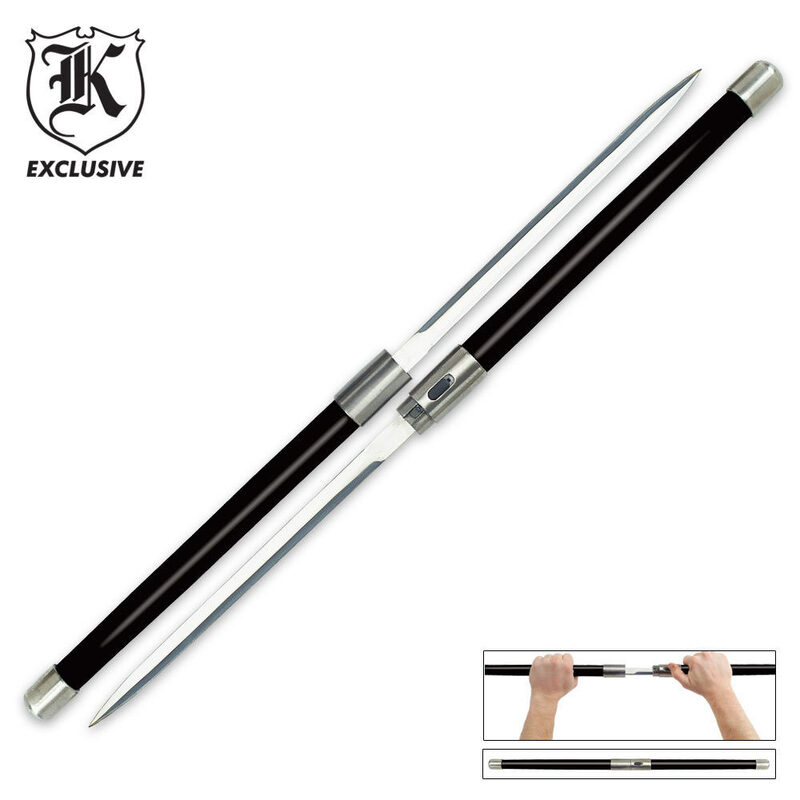 Featuring two swords with 11" stainless steel blades which slide smoothly into the steel handles. An added feature is the ability to lock the blades into place with the press of a button. A traditional martial arts favorite can now be yours. Stretches 27 " overall, closed. I just love this sword! It's not too big nor too small of a blade, the only bad thing is that the locking mechanism breaks easily and the opposite blade has a little bit of blade play, other than that I love this sword. Probably one of my best buys on this site. It took me a bit to finally get them open when I forgot them but after a couple of times of use it became a lot easier. They aren't too sharp but they are perfect! In my own opinion the price for these is quite a bargain. i was expecting more of a toy/flimsy sword.. these have some nice weight to them and they pack up well. i was pleasantly suprised. this was a really big surprise how nice and sturdy this is..
its nice and locks well blades a little dull but all in all not bad..
great deal for the price, not as sharp as I expected. As I sit here and type this to you, holding these weapons in my hands, consumers of Trueswords, I must admit, this is a par weapon. nothing to write home about one way or the other. the blades, though they don't appear it in the picture, are actually sharpened on both edges. over all, that's about the only positive quality I can find. now, for the bad side. Both of the blades are loose, and they are very difficult to both pull out or put away. to pull out because the locking mechanism is so poorly done. they are difficult to return to their respective sheaths because it is inherent of the weapons design. for that, I cannot retract from the manufacturer. over all worth the price, so beware. the blades appear to bend easily so please note that this IS a display weapon, not a "battle ready" peice. Great buy! one of the blades is a tiny bit lose but nothing that effects how it works or feels. solid strong handles and nice tips on the blades. the lock looks a little weak but it works just fine. i got this and the workmanship was great and much better than i was expecting, the only reason i put 4 out of 5 is the blade. it is extremely malleable, to the point that this can only be used as a show weapon unless you only used it for straight stabs. Otherwise a very great weapon. For $13 its what you would expect first the locking mechanism is hard to push but a little oil helped that and there is a little spacing in between both parts when closed but the good side is they come decently sharp especially the tip, the blade is double sided unlike the picture, no scratches from shipping and they are heavier than they look which gives them a good feel in your hands and they arent as bad as some people say to put back together and also do not use these for any cutting just display because the blades are thin and will come loose or break but besides that I love them and definately not the last thing I will be getting from true swords. THIS IS A GREAT SWORD SET I LOVE IT . VERY WELL PUT MADE.